The intoxicating sweet aroma of ripe mahua flowers reminds me of my childhood days at my grandmother’s village in central Uttar Pradesh. The pale yellow carpet made by the copiously falling succulent flowers around the mahua tree is still fresh in my memory. I remember people collecting the flowers every morning during the flowering season from February till April. My grandmother used to squeeze the flowers and collect the juice in a wooden tub to prepare sweet delicacies. My favourite was meethe gulgule. She would eagerly wait for the flowering season to end and for the green, plum-sized mahua fruits to appear. She would then ask a neighbour to pluck a handful of mahua fruits, called kolaiya in the region, for making kolaiya ki sabji. Though devoid of any flavour, dishes made using mahua fruits are as delectable as those from mahua flowers. Elderly people are particularly fond of mahua fruit because of its health benefits. They believe the fruit and the oil extracted from its seed cure arthritis, chronic ulcers, acute tonsillitis and spongy and bleeding gums. The bark of mahua tree is believed to cure diabetes, while its flowers are said to relieve constipation, hemorrhoids and eye infections and aid in bronchitis symptoms. A report published in the Indian Journal of Natural Products and Resources in 2010 corroborates the belief of many like my grandmother. It states parts of mahua tree have properties that make them useful as a coolant, expectorant, carminative and increases lactation in mothers. Not so long ago, mahua seed oil had been the preferred cooking oil for many in north Indian villages because of its ghee-like texture. Tribals in central India still use the oil as a substitute for ghee. This has perhaps earned the tree the moniker, “butter tree”. A recent research paper states mahua seed oil contains a mildly toxic compound, mowin, but it can be easily avoided if the oil is extracted properly. With increasing urbanisation and changing food habits, very few are aware of mahua fruit and its oil, let alone its health benefits. Mahua fruit, which was once abundantly available across northern and central India during summer, is now hard to come by. Though mahua flowers are known for their culinary appeal and use in the preparation of alcohol, it is rare to spot people selling mahua fruits even at village bazaars. I managed to procure some kolaiyas this summer after two decades. 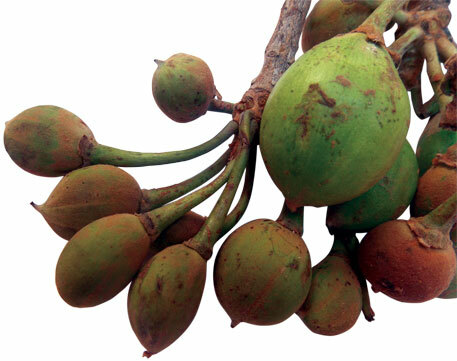 The fruit has, however, managed to retain its appeal among tribals, forest dwellers and people living in arid areas. This is because both the species of mahua—Madhuca latifolia and Madhuca longifolia—are indigenous to India and have evolved to be drought-resistant. They thrive in the widely distributed deciduous forests of the country at a time when other crops fail to survive. Heat oil in a wok and add asafetida and cumin seeds. When cumin starts to splutter, add chopped onion, green chilli and ginger-garlic paste. Fry till brown. Add chopped tomato and fry till it gets soft. Add gram flour and fry for two minutes. Add coriander, turmeric and red chilli powder to the mix. Fry for a minute. Add kolaiya and mix properly. Cover and cook on a low flame for 15 minutes, stirring occasionally. Remove from flame and add dollops of butter. Serve hot with chapati. 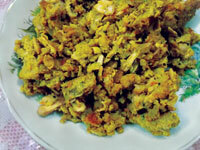 Mix the mahua juice with wheat flour and knead it into a dough. Wrap the dough with a muslin cloth and keep it aside for two hours for fermentation. Make small balls of the dough with slightly wet fingers. Heat vegetable oil in a wok and deep fry those balls till golden brown. Use paper napkin to absorb excess oil if needed. Enjoy meethe gulgule either in breakfast or as an evening snack. Thank you for covering this. Thank you for covering this. I have worked in Central Madhya Pradesh to encourage use of mahua flowers and seeds, locally known as guli. For flowers, we need to make toffees, just as the ones made for Mango and imli. For the seeds, we need small size, electric oil extracting machines, with a price tag of 10,000 Rs to 15,000 Rs. This will have less than 1Kw motor, 1 ph , 220V. This is similar to the small size atta chakki. If people have this, then they will extract mahua seed oil in huge quamtities for self consumption and selling to hotels. Further, India needs to promote use of Tendu fruit also. It is as tasty and good as Chiku. I have gone through the article. The recipe seems to be very delicious.